According to the World Tourism Organization (UNWTO), “Tourism is a social, cultural and economic phenomenon which entails the movement of people to countries or places outside their usual environment for personal or business/professional purposes. These people are called visitors (which may be either tourists or excursionists; residents or non-residents) and tourism has to do with their activities, some of which involve tourism expenditure” (UNWTO 2014, p. 1). The UNWTO further defined Tourism sector as: “the cluster of production units in different industries that provide consumption goods and services demanded by visitors. Such industries are called tourism industries because visitor acquisition represents such a significant share of their supply that, in the absence of visitors, their production of these would cease to exist in meaningful quantity” (UNWTO 2014, p. 12). Is defined by the UNWTO as “Tourism that takes full account of its current and future economic, social and environmental impacts, addressing the needs of visitors, the industry, the environment and host communities” (UNEP and UNWTO 2005, p. 12). The United Nations and numerous nongovernmental organizations (NGOs) have promoted tourism as a catalyst for development and economic growth, for several decades (Butcher 2007). To raise awareness of this potential, 2017 was celebrated as the International Year of Sustainable Tourism for Development. The aim of this special attention was to promote positive effects of sustainable tourism and initiate debates on the contribution of tourism to the Sustainable Development Goals (SDGs) (UNWTO 2016). Sustainable tourism is seen to have a great potential to contribute to the SDGs by mobilizing governments, international organizations, the private sector, academia, and nongovernmental organizations (Ibid., 2016). The international web of tourism actors facilitates money from countries with high GDP to countries with low GDP through private businesses. This flow additionally fosters investments in renewable energy and infrastructure in developing countries. Furthermore, sustainable tourism niches such as ecotourism and sociocultural tourism contribute to the SDGs in raising awareness on environmental and social challenges. Visitors gain regional and cultural knowledge, and therefore import understanding, and respect for other world regions in their area of origin. At the same time, their expenditures create income and a value for the conservation of nature for people in the host destination. Lastly, while the social and environmental awareness of the consumer rises, tourism businesses are motivated to leave unsustainable trajectories and commit to certifications and sustainable practices. In contrast to the romanticization of ecotourism as catalyst for conservation and development stands a tourism industry with high emissions and demanding working conditions. The tourism sector is currently booming. International tourist arrivals have been steadily growing by 3–5% annually for the last decade. In 2017 arrivals grew 7% culminating in 1,323 million tourists globally (UNWTO 2017, p. 1). However, rising tourist flows also raises concerns due to tourism’s contribution to climate change (Simpson et al. 2008). If the various industries in the tourism sector continue to operate as business as usual, there will be further increase in environmental degradation. This will have significant impacts on production factors that the tourism sector depends on, such as water, biodiversity, coastlines, and people. Therefore, not only from the perspective of social responsibility but also long-term business interests, the tourism industry has a high stake for making businesses sustainable through contributing to the SDG Agenda (Scheyvens et al. 2016). This chapter will explore why sustainable tourism has to move beyond ecotourism to unlock its potential to contribute to the SDGs. First the current environmental impact of the tourism industry is addressed in section “Environmental Impact of the Tourism Industry.” In section “Future Threats to the Tourism Industry,” future threats to the tourism industry will be considered. In section “Evolution of the concepts of Sustainable Tourism and Ecotourism,” the evolution of the concepts of sustainable tourism and ecotourism will be described to discuss the contribution of tourism to the SDGs in section “Tourism and the Sustainable Development Goals.” Finally, section “Conclusion” concludes with summarizing lessons learned for the contribution of tourism to the SDGs. The World Travel and Tourism Council (WTTC) reacted to the growing criticism of the tourism industry, declaring they will reduce GHG emission voluntarily. They affirmed a 25% reduction of 2005 GHG emissions of the tourism industry by 2020 and a reduction of 50% of 2005 levels by 2035 (WTTC 2009, pp. 8–9). These promises are not likely to be fulfilled without absolute reductions in aviation because they are the highest emitters (Scott et al. 2010). In addition to airlines, long-haul and luxury cruises are under critique. They generate 18 times the emissions than other methods of travel (Simpson et al. 2008, p. 144). Furthermore, these critical emission reductions are additionally unlikely to be met in the future as emissions by aviation and shipping have been excluded from the Paris Agreement. Another problematic factor can be seen in that fact that the United States did not sign the Paris Agreement. This is especially dramatic as the United States has a high carbon footprint from tourism (Lenzen et al. 2018, p. 523). Aviation, the aforementioned highest emitter within tourism, accounts for a massive 40% of tourism’s contribution to anthropogenic CO2 in 2005 (UNWTO and UNEP 2008, p. 132). Automobile transportation from tourism makes up 32% of CO2 from the industry. Accommodation contributes 21%, mostly through energy use, e.g., heating, cooling, cleaning, pools, etc. (Ibid., 2008). If tourism remains on a business as usual pathway, CO2 emissions are expected to rise drastically, with some predictions as high as a 135% increase by 2035 (Ibid., p. 141). Currently, the growth of the tourism industry is outpacing its own reduction efforts (Lenzen et al. 2018). However, emission reductions will be expected by investors, consumers, and the international community (Scott et al. 2010). This is only one of the many threats the tourism industry will face in the near future, as will be discussed in the next section. Rising emissions by the tourism industry coupled with greater environmental awareness of consumers challenge tourism service providers to implement mitigation strategies. The states with the highest stake in the emissions reductions by the tourism sector are the small island developing states (SIDS). SIDS are highly vulnerable to climate change due to their geographic characteristics, i.e., small size and isolation. Simultaneously, their economy often depends on tourism and other climate-sensitive industries such as fishing, agriculture, and forestry (Scheyvens and Momsen 2008). As a result, SIDS have called upon the international community to take action on climate change by reducing emissions and assisting in adaptation efforts at the Second international conference on Climate Change and Tourism (Davos Declaration 2007). It is predicted that extreme events, like flooding, will impact the industry by devastating infrastructure. This will result in high insurance costs and even threaten insurance coverage in some extreme cases. Health concerns will increase, due to a rising risk of vector-borne diseases, storms, and extreme events. Furthermore, coastal tourism facilities are vulnerable to sea-level rise. Energy costs increase, while demand for cooling and air conditioning rises with higher temperatures. Scarcity of essential resources like water, which tourism highly demands, impacts residents and other economic sectors. In some regions, tourism seasons might be shorter in the future due to heavy rain and heat waves. This will result in less stability in income for people who work in tourism in vulnerable destinations. Moreover, there is a lack of knowledge regarding tourists’ perceptions of changes in attractiveness of the destinations due to environmental degradation (e.g., coral bleaching, coastal degradation, and biodiversity loss) (UNWTO and UNEP 2008). The following Table 1 outlines various impacts of climate change on tourism. These impacts of climate change will have implications for tourism as well as the livelihoods of people living in affected regions. Growing obligations for the tourism sector to reduce emissions and rebuild infrastructure will result in higher costs for accommodation and airfare (Scott et al. 2010). In addition to emission reductions, a rethinking of the current high-volume tourism to high revenue tourism and promoting trips to nearby destinations is considered a crucial mitigation strategy in tourism (Lenzen et al. 2018). Consequently, shifts in demand from holidays in long-haul destinations to nearby locations are probable. This is projected to further negatively impact island destinations whose economy is already threatened by climate change (Simpson et al. 2008). The pressure to reduce emissions and environmental degradation has led to an increased interest in sustainable tourism. Sustainable tourism may be one solution for reducing dependence on fossil fuels while at the same time appealing to the rising environmental awareness of consumers (Simpson et al. 2008). The concept of sustainable tourism developed in the 1960s when researchers drew attention to the impact of human actions on the environment. Simultaneously, international tourism grew constantly, due to cheaper airline fares and a growing economy in the western world. Visitor flows from the Americas to the Caribbean, and from Europe to the Mediterranean and Indian Ocean led to a growing dependency on tourism by Least Developed Countries (LDC) and SIDS (Jafari 2001). In the 1990s, Jost Krippendorf addressed negative side effects of tourism with his book, The Holiday Makers: Understanding the Impact of Leisure and Travel. His claim was not that tourism should be restricted but that people have to be aware of the problems the industry causes in the destinations including potential negative environmental and cultural impacts of traveling. The conceptualization of sustainable tourism was influenced by the formulation and definition of the concept of sustainable development in The Brundtland Report in 1987. In this Report, the UN defined sustainable development as “development that meets the needs of the present without compromising the ability of future generations to meet their own needs” (p. 41). Sustainability is an integrative mechanism which considers environmental, social, and economic well-being as three fundamental dimensions. These three dimensions can mutually influence each other, whereby any imbalance in this model negatively affects the benefits of all acts involved. Besides tourism service providers, there are many more actors involved in tourism, such as communities, governments, or public transportation companies. Sustainable tourism raises questions about who is negatively affected by the tourism industry and who should take responsibility for tourism impact. Simultaneously, sustainable tourism provides answers how to reduce negative effects by tourism and how to distribute its benefits fairly. It is therefore defined as “Tourism that takes full account of its current and future economic, social and environmental impacts, addressing the needs of visitors, the industry, the environment and host communities” (UNEP and UNWTO 2005, p. 12). In addition to the triple bottom line combining social, environmental, and ecological sustainability, a widely accepted definition of sustainable tourism is based on Müller (1994). He advocates for a balance of economic health, general well-being of the local population, nature conservation, preservation of local culture/customs, and the optimum satisfaction of the guests’ requirements. The following figure displays what he called the “magic pentagon” illustrating the complexity of the task to balance all five elements of sustainable tourism (Fig. 1). 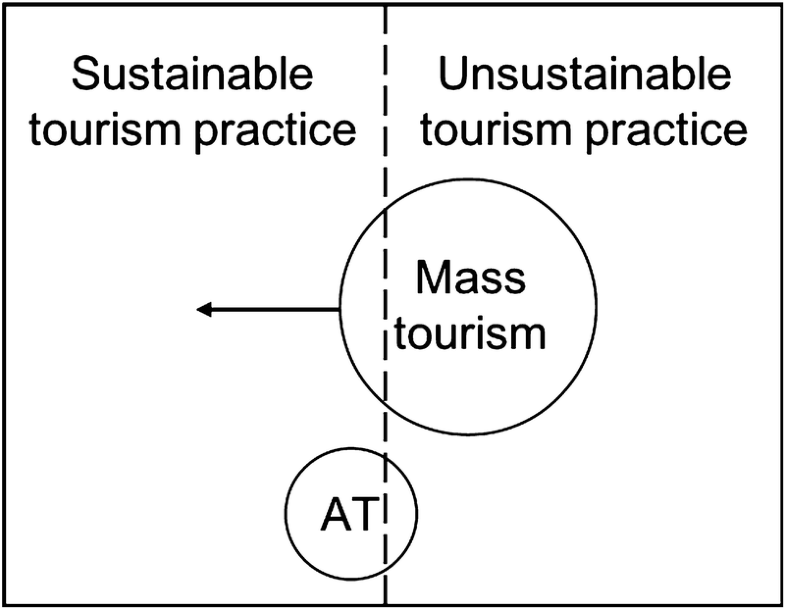 The above-described period of affirmation and institutionalization of sustainable tourism shifted to a more scientific approach in the 2000s (Jafari 2001). The ongoing international debate equates ecotourism with sustainable development and it is often favorably compared to mass tourism (Butcher 2007). Fennell (1999) illustrates this relationship in the following figure. He defines ecotourism and sociocultural tourism as examples of alternative tourism (AT) (Fig. 2). The arrow moving mass tourism from unsustainable to sustainable tourism practices indicates the greening of the industry. Sustainable tourism practices in mass tourism can be triggered by Corporate Social Responsibility (CSR). The development of environmental management systems or certification leading to a more sustainable behavior has been one tool in combating some the issues with sustainable tourism, e.g., involving local supply chains or recycling waste. Fennell assumes alternative tourism to be generally more sustainable than mass tourism. However, he acknowledges that not all alternative tourism products and services are sustainable. The fine line dividing unsustainable tourism practices from sustainable tourism practices was analyzed by various researchers in the beginning of the 2000s. These researchers provided general overviews of ecotourism (Fennell 1999; Page and Dowling 2002), critically examined it as a western construct (Cater and Cater 2015), and discussed empowerment through ecotourism (Scheyvens 2002), certification of ecotourism (Honey 2002), pro-poor tourism (Hall 2007), ecotourism for development (Butcher 2007), and ecotourism in practice (Buckley 2009). Collections of case studies not only discuss why specific cases were successful but also criticize poor implementation of ecotourism (e.g., Hill and Gale 2009). Simultaneously, the recognition of tourism as a strategy for the valuation of nature is growing in conservation research. Conservation projects have begun to adapt tourism in order to increase the value of sustaining natural resources for nearby communities (Western et al. 1995). However, despite their positive reputation, most community-based conservation projects have resulted in disappointing outcomes due to uneven distribution of benefits, excluding residents from natural assets, poor implementation, and overly aspirational targets (Balint 2006). This asymmetry in the magic pentagon (as described above) leads to disputes among different interest groups which backfire on conservation outcomes (Western et al. 1995). Despite increasing recognition of these failures and actions to increase local participation and empowerment, international organizations are criticized for using sustainable tourism to promote neoliberal political agendas with disregard for local concerns. The limits to success of ecotourism described above and the high emissions by the tourism sector emphasize the complexity of using tourism as a development strategy. The unfair distribution of costs and benefits in the past indicate the need for systematic, critical, and integrated approaches. This is especially important when promoting sustainable tourism as catalyst for development and economic growth and leading toward the realization of the SDGs. The relationship of tourism and the Sustainable Development Goals (SDGs) will be displayed in the following. Tourism products and services are carried out by an international web of diverse actors. As a result, systematic emission reduction, adaptation to future threats, and a change to sustainable practices will not be achieved by tourism service providers alone but instead demand a similar commitment by governments and travelers (Bread for the World 2016). This integrated change to sustainable practices is believed to have a transformative effect on other sectors as well. In addition to the responsibility to reduce negative effects of their own actions, tourism actors are expected to perform to the highest standard in their contribution to the Sustainable Development Goals (SDGs). The International Year of Sustainable Tourism for Development in 2017 and the World Tourism Organization (UNWTO) emphasize this potential of the tourism sector to take a leadership role in realizing the SDGs. Even though the UNWTO recognizes linkages between tourism and all 17 SDGs (UNWTO 2016), tourism is specifically mentioned in the following targets of Goal 8, Goal 12, and Goal 14 (Table 2). In the following, tourisms potential to contribute to these three SDGs will be discussed. Tourism is already the third most important export sector worldwide, ranking ahead of food and automobile industry (UNWTO 2017, p. 6). Simultaneously, it is one of the fastest growing industries and is about to expand twice as rapidly in emerging economies than in advanced economies by 2030 (UNWTO 2017, p. 14). This growth is especially powerful because the tourism sector is a cluster of production units in different industries. In 2017, tourism supported 9.9% of the total employment and generated 10.4% of the global GDP (WTTC 2018, p. 1). Tourism is argued to be an effective source of foreign currency as it facilitates employment and opportunities for nations to further develop their economy (UNWTO 2016). The economic benefits of tourism exceed tourist spending in the destination (direct impacts). When sustainable tourism is promoted, visitors support local businesses (indirect impacts of tourism), and tourism employees and entrepreneurs spend their income in the region (induced impacts). This effect of tourist spending is displayed in the following Fig. 3. However, even though many tourism businesses comply to CSR, promote local products, or offer ecotourism activities in nearby protected areas, international chains are often criticized as transferring their incomes back to their countries of origin. Additionally, many products in tourism are all-inclusive packages which cumulate tourist spending to one company. Moreover, many provide imported products for their guests which prevents induced impacts for the society of the host country (Mitchell et al. 2015). Consequently, the majority of tourism spending leaks to the home countries of the businesses. Therefore, the benefits of tourism leak out of the host region while local stakeholders carry the costs of tourism, e.g. building infrastructure, environmental degradation, and loss of cultural identity. These leakages highlight how the balance of all aspects of sustainability is crucial for positive outcomes of tourism. Although it is understood that the inclusion of vulnerable groups is important to strengthening tourism, further improvement of working conditions with an emphasis on knowledge building and support for local products and professionals is still needed (Bread for the World 2016). While tourism has the potential to contribute to economic growth and employment in some cases, the increasing environmental degradation caused by the sector is alarming. It was found that the promotion of growth in tourism will create more emissions than in other sectors. This is the case as global tourism activities emit more carbon per dollar earned than other highly emitting sectors like manufacturing or construction (Lenzen et al. 2018). Sokhanvar et al. (2018) tested causal relationships between international tourism receipts and economic growth in 16 emerging economies. Economic growth through tourism was only evident in Brazil and Mexico. Because of this the authors recommend investments in other industries in all remaining countries analyzed, including Indonesia, Malaysia, and Peru. It must be carefully assessed if tourism development is the most sustainable pathway for a certain region compared to other investments. The inclusion of local products and professionals is crucial to reducing emissions in the destination. Production in tourism is often a combination of single services, which are packaged and sold as one experience. The more single services that are combined in one tourism product, the higher the financial benefit for this product (McKercher et al. 2010). The most common elements are transport, accommodation, food, and activities. This results in several state and non-state actors being included in production patterns. In order to ensure sustainable consumption and production, tourism producers should “promote social responsibility and sustainability in the supply chain by training and evaluating suppliers and by including the relevant clauses in contracts” (UNWTO 2016, p. 42). Several environmental management systems and certifications are available to guide tourism actors in implementing systematic change. This awareness raising is crucial for reducing the leakage of money and reducing emissions at the destination. In addition to mitigation in the accommodation and other activities, behavioral change by tourists is expected to reduce transport emissions due to an increased length of stay in the destination and a preference of regional tourism (Simpson et al. 2008). However, a romanticization of presumably sustainable niches such as ecotourism as more responsible forms of travel has trivialized negative effects of tourism in the past. Firstly, consumer awareness about the impact of long-haul flights on the environment still needs to be improved (Higham et al. 2014). Secondly, the ecological impact of ecotourism needs to be assessed (Buckley 2009). Even for effects that have received more research attention, e.g., pedestrians walking on ground-layer vegetation, we lack holistic knowledge of the impacts on ecosystems and species. Buckley (2009) suggests that there is a need for further research related to the impacts of different ecotourism activities for all continents. Another analysis of ecotourism projects demonstrates that the majority of projects do not produce the expected outcome. Many lack proper monitoring, evaluation, and management (Das and Chatterjee 2015). Romero-Brito et al. (2016) further detect a lack of tangible and quantifiable contributions of ecotourism to conservation, e.g. by the viability of threatened species populations or increases in the number of individuals (p. 12). Experience shows that neither promoting responsible travel behavior nor technological improvements by tourism actors as proposed by the UNWTO created tangible results. Therefore, the industry may be confronted with demands for commitments through carbon taxes or carbon trading schemes (Lenzen et al. 2018). The Green Climate Fund (GCF), established in 2010, is supposed to delegate finance to climate change mitigation and adaptation measures. It is planned to become the main multilateral financing mechanism to support climate action in developing countries. In 2015, Hela Cheikhrouhou (first executive director of the GCF) announced that climate change adaptation in SIDS will be a priority of the fund. The special attention SIDS receive, e.g. with the International Year of Small Island Development States in 2014, portrays SIDS as climate victims and hinders a discourse on an equal basis. This dynamic is also reflected in the fact that emitters tend to support funding initiatives rather than committing to serious GHG reductions (Dornan and Shah 2016). This is especially questionable because the current finance for climate change mitigation and adaptation is criticized to allow the powers of the free market an ongoing deterioration of environment and livelihoods (Bracking 2015). Sustainable tourism is being promoted as a way to reduce the tourism sector’s negative effects and to contribute to the SDGs. It is further considered to be a strategy for mobilizing stakeholders, fostering change in policies, and influencing business practices and consumer behavior. However, sustainable tourism is still a niche within the tourism sector and has not yet replaced business as usual methods. Alternative forms of tourism such as ecotourism comprise a small section of the current tourism market and will not reduce the sector’s emissions significantly. There are still many factors that limit the contribution of the tourism sector to the SDGs. Sustainable measures for private actors, promoted by the UNWTO like the support of local economies, the inclusion of vulnerable groups, or carbon offsetting, are well-intentioned market-based approaches. However, the urgency of current rising emissions in the sector might demand for command and control measures. Market-based solutions or certifications of environmental management systems lower concerns about the environmental footprint of tourism products, while the real impact is not transparent and still understudied. There is a risk that celebrating sustainable tourism will result in rising GHG emissions, supporting greenwashing, and transferring the responsibility for reducing emissions to the consumer. The goal of a single tourism business is short-term gain and profit maximization. Therefore, large impactful, voluntary investments by the tourism industry are unrealistic. Continuous economic growth is conflicting with long-term Sustainable Development Goals. This means that a leading role in committing to sustainability and voluntary emission reduction cannot be expected from the private sector in the current environment. The SDGs must be a commitment for all stakeholders involved: consumers, governments, NGOs, and businesses alike. Nevertheless, tourism is a sector that has the potential of creating relationships between people, economies, sectors, governments, and regions. The International Year of Tourism for Development already increased awareness of the benefits and limitations of sustainable tourism. Sustainable tourism has been an effective starting point for discussions around the implementation of the SDGs. It is crucial that the praise for sustainable tourism’s contribution to the SDGS does not trivialize the sector’s responsibility, especially emissions that lead to climate change. The airline industry, as the biggest emitter of the tourism sector, should not leave the focus of international debate. In the end, all tourism actors must work together to achieve a significant emission reduction. This is crucial in order to unlock tourism’s potential to contribute to a sustainable future.